B’ e cath mara a bha ann am Blàr Jutland (Beurla: Battle of Jutland; Gearmailtis: Skagerrakschlacht) a chaidh a chur bho 31 an Céitean gu 1 an t-Òg-mhios 1916 eadar cabhlach na Breatainne agus cabhlach na Gearmailte mar phàirt den Chogadh Mhór, 1914-1918. Chaidh a chur sa Chuan a Tuath, faisg air costa Jutland san Danmhairg. 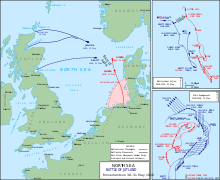 Air a tharraing à "https://gd.wikipedia.org/w/index.php?title=Blàr_Jutland&oldid=538935"
Chaidh an duilleag seo a dheasachadh 30 dhen Lùnastal 2017 aig 11:45 turas mu dheireadh.